I recommend searching out an image of the Japanese box art, it’s quite good! The resurrection of Dracula isn’t enough to deter feelings of resentment and rivalry in Hugh Baldwin. The young vampire hunter is distraught after his father, Morris Baldwin, gave his treasured Hunter Whip to Nathan Graves, the protagonist of Castlevania: Circle of the Moon. The three arrive too late to the Austrian castle where Dracula is being revived. The dark lord captures Morris and isolates himself from the two young apprentices. Rather than seek out their mentor together, Hugh sets off on his own wanting to prove himself to his father. Hugh’s sour feelings are brought up multiple times as the player encounters him while exploring the castle, but there’s no depth to this plot. Ultimately, Hugh realizes the darkness in his soul would be his downfall and redeems himself. Lackluster story or not, it’s all supplementary to the player’s exploration of Dracula’s castle. While newer 2D Castlevania games have progressed in nearly every department, Circle of the Moon is still a game worth playing. Exploration has been one of the hallmarks of the Castlevania franchise since the beginning and Circle of the Moon retains this element. Dracula’s castle is both expansive and limiting and the same time. The player is limited from outright exploring every area due to obstacles that cannot be overcome until a required item is unlocked. There are many such roadblocks to progression forcing the player to explore the castle sections at a time. Still, the player has much freedom to wander about and discover rooms with stat boosters and tougher enemies. The design methodology seems to encourage players to spend time exploring while preventing them from encountering enemies much too tough for them. 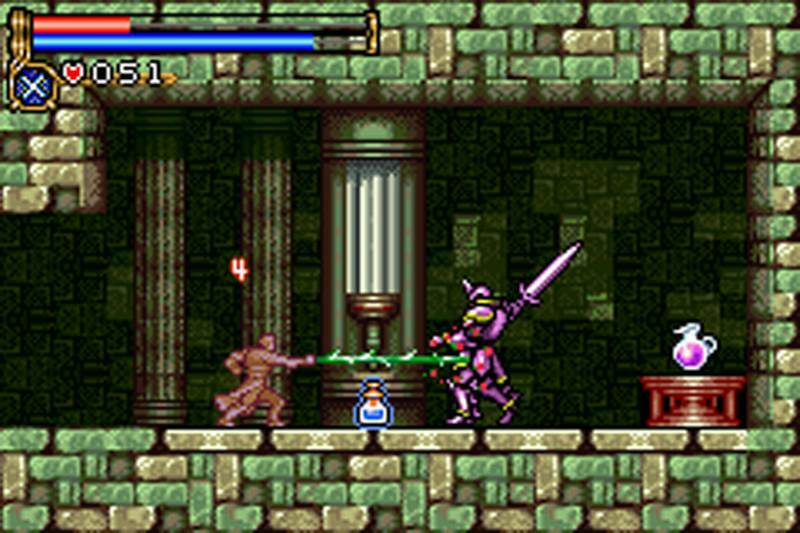 As players traverse Dracula’s castle and defeat enemies, Nathan levels up and becomes stronger and more resilient. Players also have a few options for customization by equipping different pieces of gear or making use of Circle of the Moon’s unique Dual Set-up System. 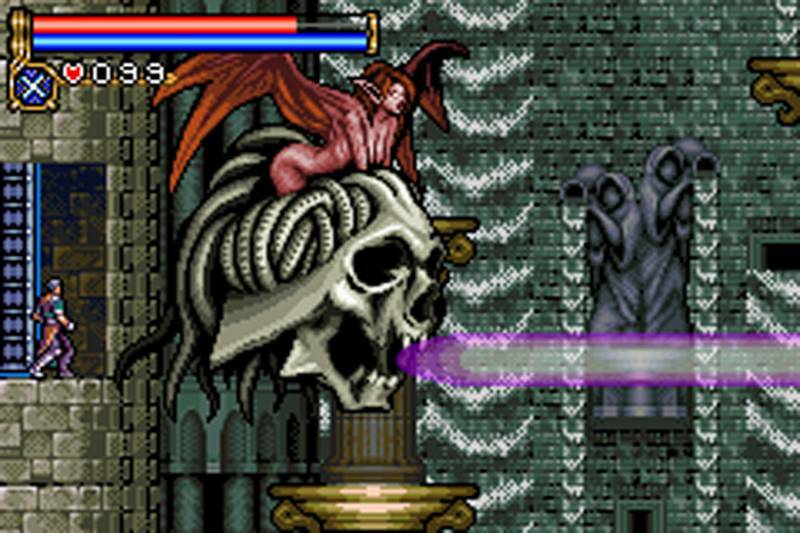 The gameplay draw for this Castlevania game, the DSS, allows users to combine magical cards they’ve come across to enhance their combat proweress. By combining an action card and an attribute card, players can unleash special attacks or increase their stats. I wasn’t impressed with the system for the majority of the game, tending to rely on a combination for many hours without alternating. As Nathan’s quest became more difficult though, I experimented more and by the final battle with Dracula, I was switching between three combinations depending on the circumstances. The bosses are not to be trifled with. I had to spend a small amount of time grinding levels for some of the later bosses. Apparently the score is mostly composed of songs from past games in the series, slightly revamped. I’m not intelligible enough in regards to the series to say whether or not these versions are better, but I can say that I sought out a few of the tracks and put them on my iPod I liked them so much. “Awake” was introduced in Circle of the Moon, “The Sinking Old Sanctuary” is from the Genesis game Castlevania: Bloodlines and “Clockwork” is from the NES game Castlevania III: Dracula’s Curse. I would’ve embedded them, but WordPress doesn’t allow mp3s, so I’ll just say search them out. 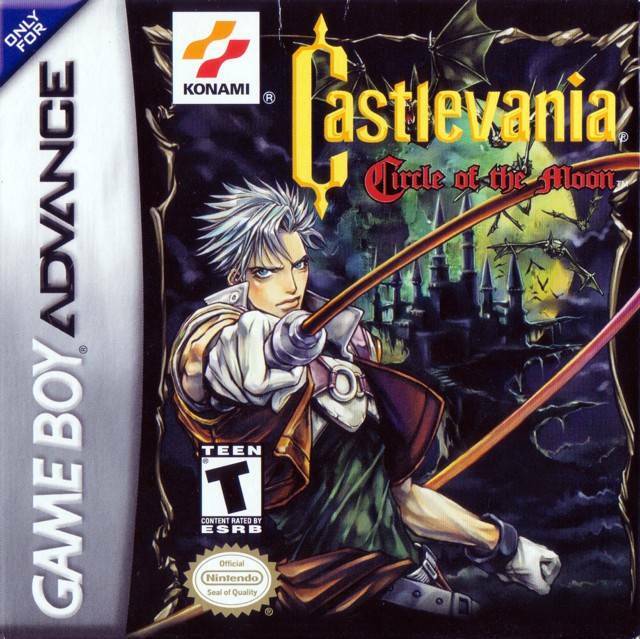 Castlevania: Circle of the Moon was on the receiving end of some controversy in the late 2000s when Mr. Castlevania himself Koji Igarashi struck the game from the primary timeline. This action is something only the most fervent fans will care about, but it sent a message that Circle of the Moon was not as respected other titles. (Perhaps this was personal though as IGA didn’t have any involvement.) Still, Circle of the Moon is well enough worthy of the Castlevania moniker – it’s a superb action game. This is such a good game! It was actually the first GBA game I really enjoyed, as well as my first castlevania game I actually beat! I usually stuck to the same DSS setup as well, so that was disappointing. Even for as good as this game is (and it’s still good by today’s standards), I think it was the weakest of the GBA castlevania games. I loved Aria of Sorrow immensely, and highly recommend you to play it. It makes me wish I would’ve picked this up instead of Wario Land 4 whenever I bought a GBA, not that it’s a bad game. I love Aria of Sorrow! Dawn of Sorrow too. I missed out on the Castlevania games post Dawn of Sorrow so I’m looking forward to digging into some more. Yeah, I recommend those as well. Portrait of Ruin is really good, and a nice shift from the standard formula (without sacrificing too much). I have yet to play Order of Ecclesia, but I’ve been on the hunt for that one as well. Hey John, good to see you blogging again! I have always wanted to play this and the other Castlevania GBA games. Heard nothing but good things about them. Big fan of Dawn of Sorrow and Portrait of Ruin, though. Thanks; I’m glad to have the time to again! If you’ve played those, you’re not missing out. I love Dawn of Sorrow although I’ve yet to play Portrait of Ruin. I’d kill for an HD anthology of all the classic Castlevania GBA games. They were a bit repetitive when playing one after the other, but still some of the best games the series has to offer. That’s a good thought. It’d be interesting to see Konami tout some of these older Castlevania games and I imagine a healthy amount of people would buy in on a deal like that.